Create a global employee experience where everyone is equal, no matter which office they’re in. Remember when there was no easy way to access the internet and we couldn’t do our job effectively from anywhere other than our place of work? Me neither! Like many millennials, I was born around the same time as the world wide web, in the late 1980s. Although I still dimly remember the struggles of dial-up internet and a world where mobile phones were rare, for most of my professional life I’ve enjoyed robust internet connectivity. This huge advance in technology leads to a frequent and tedious criticism from older generations: millennials are lazy, they don’t get out of bed on time, they show up late and sometimes don’t even come to the office at all. Seriously, how on earth can they be effective at their job without being glued to a desk for 8 hours in a row? This is lazy thinking, to be honest. With current technology, I can easily speak to someone in New York over a video call, reply to a bunch of emails and instant messages, schedule the next day’s meetings, share important documents with our co-founder and keep up-to-date with the latest startup news – all before I even get out of bed. The challenge is not whether to use technology, but how to use it to best effect in a global organisation. At finder we use Slack for instant messaging. This enables us to include everyone in one global conversation, but also communicate effectively on country-specific issues in segmented channels. We use Zoom for video conferencing which allows us to speak to and connect with crew from all of our offices, and easily share documents and presentations. Every time we hold a 90-day presentation on company progress or our annual finder Summit to share big ideas and plans, we live stream globally and record the event for anyone who isn’t able to join because of time differences. One of our core values at finder is “1crew” – we have a truly global team of 256 amazing humans spread across Sydney, New York, London, Manila and Wroclaw offices, along with many others in remote locations. While the business was founded in Sydney there are no “satellite offices” or “offshore teams”. Everyone is seen simply as a member of our global crew. Everyone is a first-class employee and we do our utmost to ensure that people always feel this way. 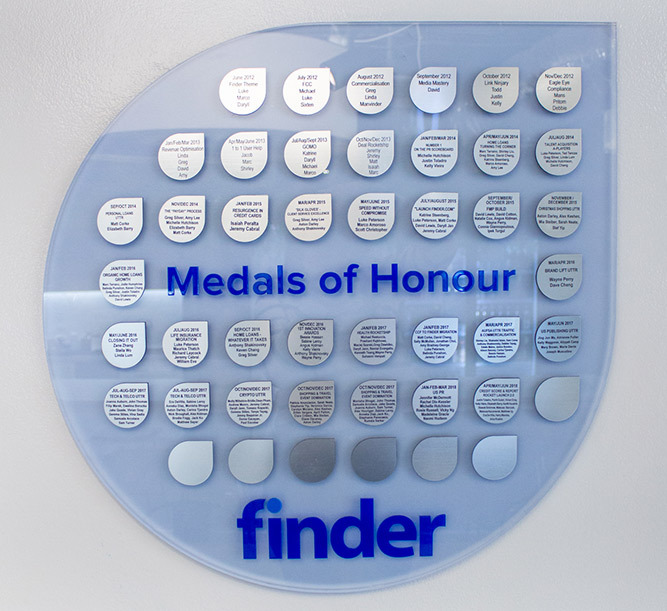 When you earn a place on the Medal of Honour Board at finder you receive a certificate to celebrate your involvement in a project which really helped to make a difference, no matter where you are based in the world. The same applies to our Medals of Service, which everyone receives when they hit three, five and ten years employment. To further enhance that global vibe, we make sure every one of our staff members has access to our finder “merch”. Employees all over the world can wear their finder hoodie, drink from their finder water bottle and take notes in a finder notebook. While that’s a simple step, it reinforces that we’re all part of the same crew, striving for the same goals. Our incredible global office experience manager, Manuela Santos, ensures that everything we celebrate in Australia is celebrated in every office. For every award and medal earned by our crew, Manuela ensures it reaches them wherever they are! As I write, she’s over in the US helping our New York crew move into a brand new office space. Her key task is to ensure that the office feels like a finder space and has the same perks and features as we have here in Sydney. She’s even added the astronaut to our US Rocketship! Feeling closely connected to the business you’re working in is a basic prerequisite in today’s ever-increasingly competitive war for talent. Shared purpose, shared values and global connectivity through technology all play a role in achieving that connection. Throughout this series I’ve attempted to dispel some of the myths surrounding millennials and offer insights into what’s truly valued by the current and next wave in the labour market. Obviously I’ve only scratched the surface, but I hope this has given you a deeper insight into the truth about this generation of employees, from the perspective of a millennial working in a thriving team filled with other millennials.